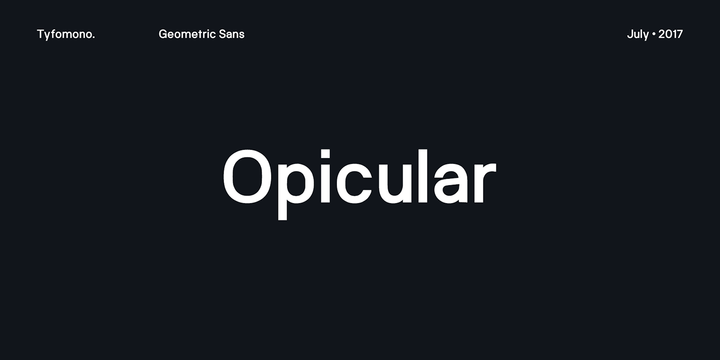 TF Opicular is a a modern sans serif typeface created by Firman Suci Ananda together with Fajar Wahyu Pribadi and published by Tyfomono which comes in 6 styles, 3 wights (Regular, Medium, Bold) with accompanying italics. Based on geometric typical characters, is suitable for typographic use, on both digital & print. Have fun! Price: only $120,00 for all 6 fonts. A font description published on Wednesday, July 26th, 2017 in Fajar Wahyu Pribadi, Firman Suci Ananda, Fonts, Tyfomono by Alexandra that has 2,378 views.